First introduced at Medtrade last fall, the LifeChoice Activox DUO2 has recently received approval by the FDA. 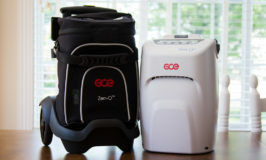 The Activox DUO2 is the first fully-integrated stationary and portable oxygen concentrator system, combining the benefits of a home oxygen concentrator with the portability of the LifeChoice Activox portable oxygen concentrator. The integration of these two concentrators is accomplished through a charging station located on top of the home concentrator that allows you to dock your Activox portable concentrator. The Activox battery is charged as it sits connected on top of the home concentrator; there is also a charging port for an external battery. When you’re ready to leave home, you simply disconnect the Activox from the DUO2 and you’re ready to go. The Activox POC will also be used diagnostically to test the DUO2 home concentrator. 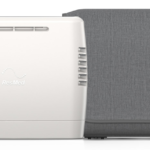 The Activox DUO2 will provide up to 5 LPM continuous flow oxygen for patients at home and up to setting 3 pulse flow for portability outside the home. Users will be able to enjoy an average of 6 hours of internal battery time while away from home, and an additional 3 hours with the use of a supplemental battery. When it is time to recharge the batteries, the stationary home concentrator can recharge both the internal and external batteries of the Activox portable concentrator. Now that the LifeChoice Activox DUO2 has received FDA approval you can expect to see this powerhouse system available on the market soon. Most POCs delivery greater than 90% oxygen. 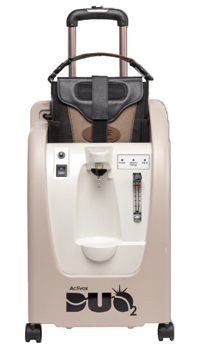 I am not a company and only provide information about oxygen concentrators.